According to data from analytics firm Net Applications, Internet Explorer may be making a slow come back after years of being on the decline. Although IE's market share only ticked upward from 53.83 to 54.09 percent, this is compounded by previous gains in recent months. In February, IE accounted for 52.84 percent of browsers used online. Although the most widely-used version of Internet Explorer continues to be IE8, usage of IE9 continues to grow. 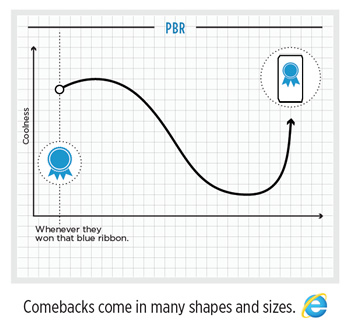 Microsoft's latest browser weighs in at 15.91 versus IE8's 26.22 percent of market share. Perhaps those quirky ad compaigns actually are helping? And despite the company's best efforts to rid the world of IE6, its lingering ghost continues to haunt 7.11 percent of web-goers. Chrome has been on the rise for quite some time, inching up from 18.85 to 18.87 percent of the browser market. Thanks to its aggressive updater, the most popular version of Chrome is the latest version: 18. Most interestingly, while Chrome and IE enjoy small gains in market share, Firefox seems to be slipping. Although the drop is marginal -- 0.35 percent -- Firefox's decline from 20.55 to 20.20 percent may be in indication that Mozilla is losing the hearts and minds of Internet citizens. The most popular version of Firefox being used is 11. When it comes to perusing the Internet on mobile devices, an overwhelming majority of those people (63.8 percent) are on iOS. Android comes in a distant second at 18.9 percent while Opera Mini rounds out the top three with 12.1 percent. Net Applications' data suggests that people may prefer using their iPad over the iPhone for purposes of surfing the web. Despite iPhone sales being considerably higher than that of the iPad, the latter is used more frequently to access websites despite the former being a more ubiquitous device. Although both devices have been neck and neck in recent times, the release of the latest iPad coincided with an abrupt spike in iPad market share. This spike has allowed the Apple tablet to surpass iPhone surfers by more than 6 percent.